We write to you today to ask you to consider a donation to the Many Hands Sustainability Center. We have had this non-profit branch of Many Hands Organic Farm for 12 years now. As you know, a farm is an ideal spot for people to come together. There we learn real skills, build healthy bodies, experience a vibrant community of people, animals, plants and microbes, and build confidence and an improved sense of self that can carry us throughout our lives. Not only can we learn how to work in collaboration with living things, but we can also see how we fit into this thing called the natural world, not as the masters of it, but as junior partners. Brent and Mario were inseparable, Brent for his command of the tractor, Mario for his enthusiasm and adventurous spirit. 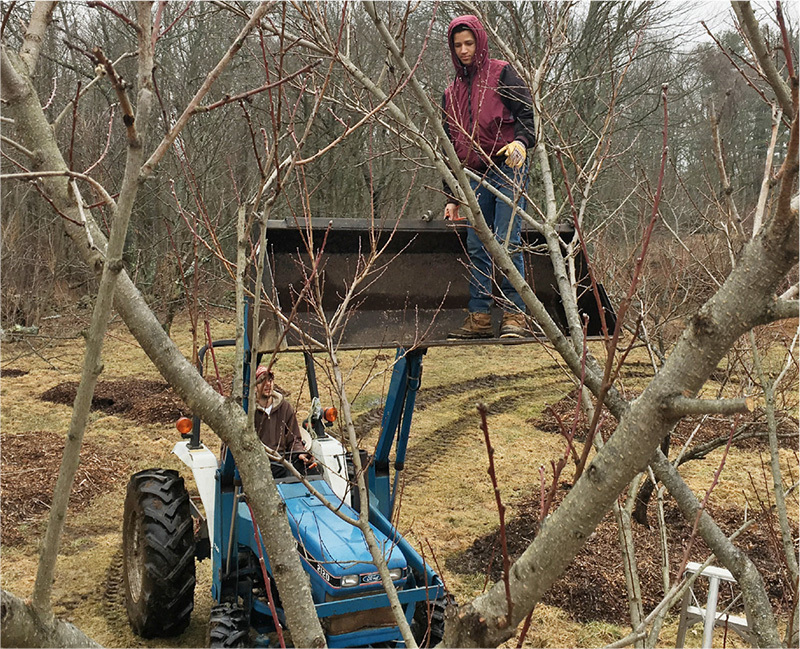 Here they prune fruit trees in late winter. This year’s stars include the year-long duo Clare and Brent, and also Mario from Stetson, now moved on, part time staff including Josh, Ben, Max, Jihad, and Luke, working shareholders Raina and Ann, Seven Hills staff John and Linda, and the myriad Stetson boys who come Mondays and Fridays to help out. There is another layer of short termers and passers-by who fill in momentarily or for maybe a month. All bring with them their own essence and gifts to make this organism that much more relevant each year. Working shareholder Ann stops to laugh while she and Clare hand prep beds. Next year, with the right equipment, we are moving on from that! If you spend more than five minutes with us you know we are crazy about carbon sequestration for crop health and climate amelioration. 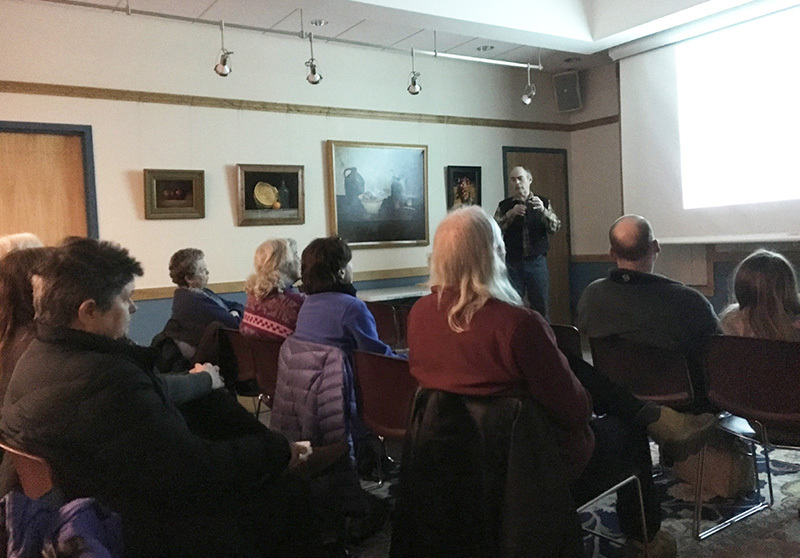 We got to speak all around the Northeast many different times this year. Our presentation includes Jack with the science and Julie with the practical know-how. It seems to be a winning combination. And of course college, hospital, high school and all sorts of groups stop by. We usually get a fair amount of work out of them, and then share our pearls of wisdom. We continue to innovate with no-till certified organic and microbial friendly practices that have helped our quality steadily climb over the past 4 years. This year we hope to win a grant for a no-till soil prep implement to increase our efficiency in bed preparation. Brent uses our Ford 2120 like a master artist uses a paint brush. 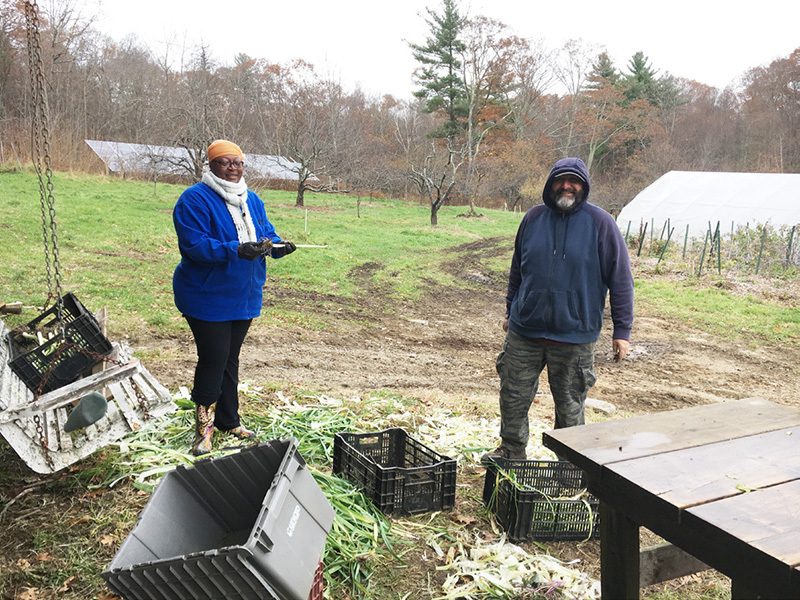 Ann and John prepping leeks on a very cold day. The customers like to eat no matter what the weather. Julie loves teen age boys, and we sure have a lot around. Stetson School in Barre provides us a steady stream along with our summer local help. Mario was with us for two years as a summer and week-end employee and has now graduated. In that span of time he became one of our “farm family” members. With Linda and John we have moved to a new level of engagement involving the guys who often have not had much of a shake in life. Twice a week we share the work load of running this very diverse farm and find skill-appropriate work for each and every one. Then we share lunch together, and pull it all together. This week as we laid cardboard and hay we discussed re-starting a garden at Stetson in 2019 to go along with their new clutch of resident laying hens. Ah, to bring back the farm that was once at Stetson when it was an orphanage! 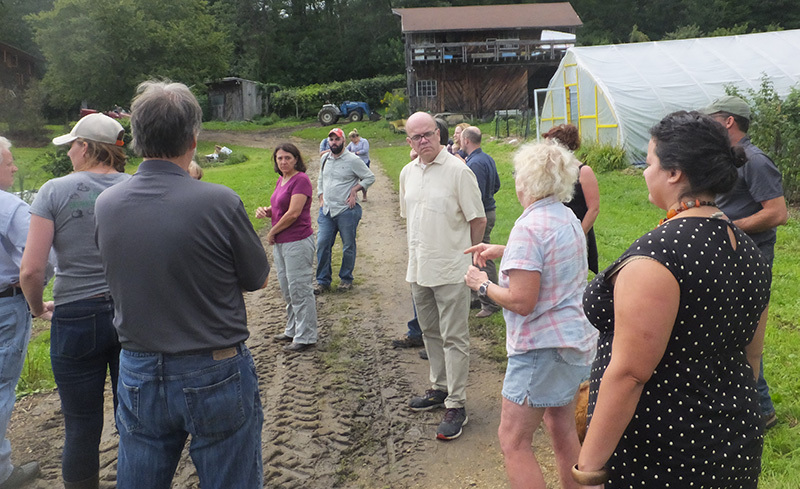 Julie talks with our visiting Congressman, Jim McGovern, about how properly raised food can be medicine. McGovern is on the House Agriculture Committee and visits farms in his district every August. Come the new year he is in line to become chair of the important House Rules Committee. We have a modest budget at MHSC and use your donations to support employment and educational and health resources for our recovering addicts on the farm. Addiction recovery seems to never be quite complete, and daily attention and support by all of us here is needed for success to be a reality. 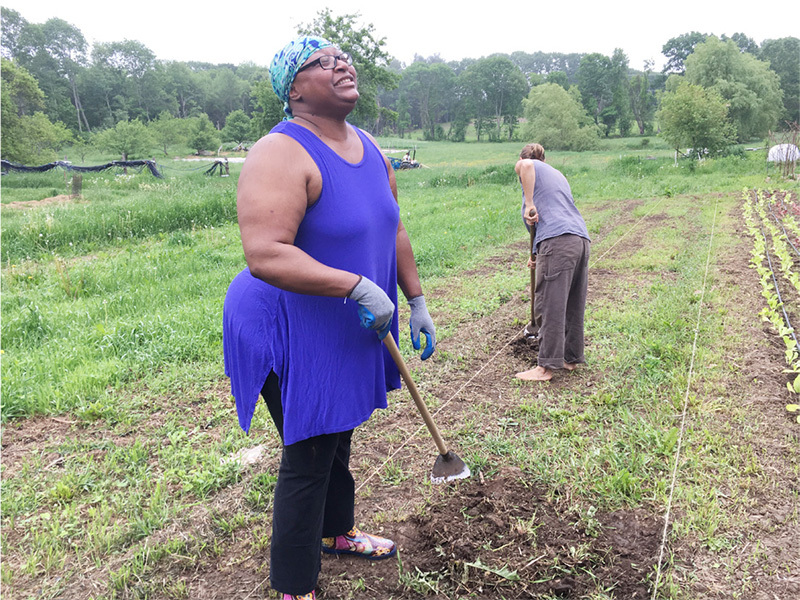 We appreciate any donation that you share with us as we attempt to use our farm for a place of education, inspiration, healing and human integration.